The 48th International Paris Air Show took place between June 15 and June 21, 2009. The event, which is considered the largest showcase of aerospace technology in the world, has been around since 1909. In 1951, on the eve of the Space Age, Paris Air Show moved to Le Bourget airport, where it was held biennially ever since. The USSR regularly used the event to advertise its aviation and space technology. In 1967, it was the site of the first public display of the Vostok rocket. In 1989, a giant Antonov-224 Mriya transport plane landed in Le Bourget, carrying the Buran reusable orbiter on its back. Roskosmos and ESA sign agreement on Russian supply of the gamma-ray scientific instrument MGNS for Europe's Bepi Colombo mission to Mercury. 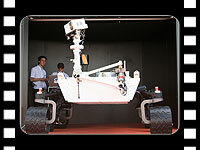 Russia and CNES sign a cooperation agreement on French involvement in the Russian Phobos-Grunt mission. Roskosmos and Italian space agency to cooperate in remote-sensing missions. ISS Reshetnev and Thales Alenia to sign an agreement on joint development of communications satellites. Russia and Canadian Space Agency discuss six different cooperative projects. NASA receives proposals from partner agencies for the extension of life span of the International Space Station from 2015 to 2020. Khrunichev enterprise to resubmit proposals by the end of 2009 on its participation in the development of Russia's next-generation launch vehicle for manned space flight. Phobos-Grunt remains targeted for October 2009 launch, despite tight schedule. While the target date of the first launch of the Soyuz rocket from the new launch pad in French Guiana remains December 2009, a number of Russian officials say it will be more likely beginning of 2010. The mobile service tower remains a major stumbling block.